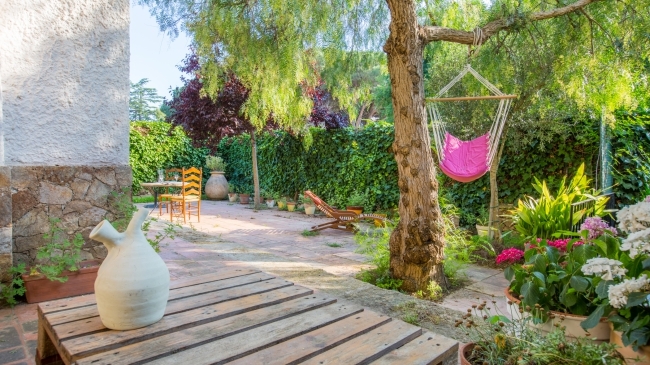 Very simple house (65 m2 + 500 m2 for plot) located 3 km from the beach Cala Canyelles and 8 km from the centre of Tossa de Mar, ( 6 Km from the centre of Lloret de Mar), in the housing development of Font de Sant Llorenç. It has 3 double bedrooms (6 single beds), a living-room, a kitchen, washing machine, 2 bathrooms (1 bathtub + 1 shower). Private pool (6 x 3) and garden. Portable barbecue. Porche. Views of the sea and mountains. Garage. The pictures of the beach do not correspond to the view from the house. They are of Cala Canyelles, the closest beach to the villa. Cala Canyelles is a pretty stretch of the Costa Brava's coast with 500m of the characteristic coarse white sand beach of the area. Umbrellas and deck chairs are available to rent as well as activities like pedal boats, parasailing, water- skiing and canoeing. Also you can taste the Mediterranean food, fish and paellas, in the restaurant placed on the beach. 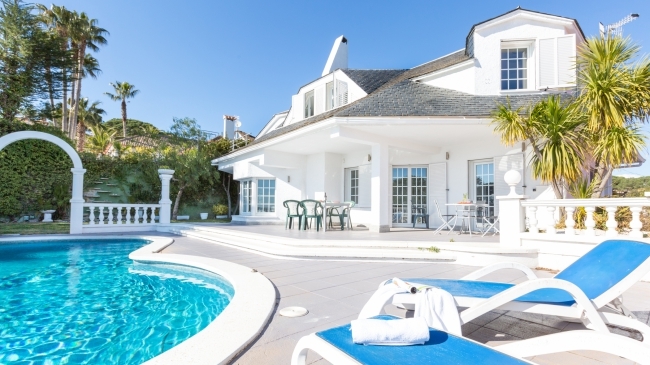 Villa Montse is a nice and very cozy house, placed in a very calm residential area of Blanes (Sant Daniel), 6Km of the beach and 5Km to the centre. The house ((120m2) and 500m2 of plot) has a capacity for 8 people. It divides into 2 floors. On the 1st floor there is a large lounge dining room (40m2) plasma TV,fireplace. There is a very well-equipped kitchen (microwave, dishwasher, washing machine, gas stove ...) and a bathtoom with a shower and a tub. The top floor is composed of 4 rooms; 3 matrimonial (2 of 135x190cm + 1 of 150x190cm; 2 of them with exits to a terrace), 1 twin room with 2 beds (90x190cm). 1 bathroom with a tub. An exterior very elegant zone and with magnificent mountain views. Porch, swimming pool (7x3.5), barbecue and swings for the children. Garage with capacity for 1 car. Optional heating. Not included in the cost. Price extra in case of use: 50 Euros / week). Petanque. Optional wifi Conection, extra cost of 30€ /week. Basic house distributed in 2 floors, located in Llafranc, just 100m from the beach and the center. On the ground floor we find 1 bedroom with 1 single bed of 80x180cm, 1 bathroom with a small bathtub, 1 living-dining room with TV and fireplace and a kitchen (ceramic hob, oven, microwave, washing machine). On the upper floor we find 3 bedrooms (1 with 1 double bed (150x190cm) and 2 with 2 single beds (90x180cm) in each and with access to the balcony), 1 bathroom with shower. 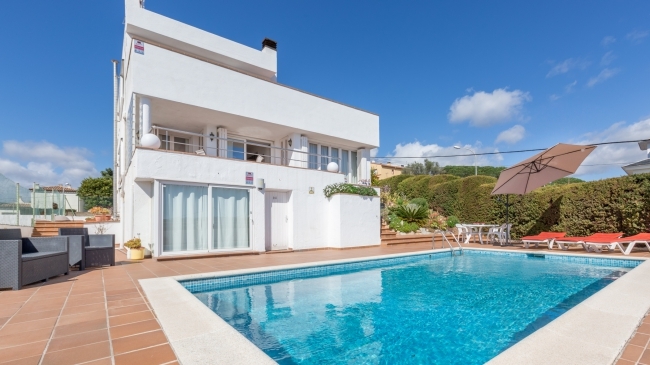 House located in Llafranc only 100m from the beach and the centre. It has 3 double bedrooms (1 double bed; 4 single beds) + 1 single bedroom, 1 bathroom, 1 toilet, a living-room (TV, fireplace), a kitchen, washing machine. Balcony and terrace.